Social media is not currently a ranking factor for SEO, however, there are several ways Social Media can influence and improve your rankings and visibility. Also, obviously, you want your website to rank for your target keywords, but getting your social profiles to rank for keywords is still a win! By driving traffic to your social channels, you help to improve your business’ visibility, prominence, and hopefully drive those users back to your website. Social Media has the potential to help gain links. Social Shares themselves do not technically count as links, however, the more shares of your content that are on social, the better the chances of people finding, sharing, and linking to your content. Social media can also help with your brand awareness and grow, or build, your audience. It isn’t enough to have a website living unconnected on the web these days. People need to be able to find you to know you. Sharing content on social media helps you reach users who are looking for and interested in what it is you do. This also helps to create brand awareness and increases the likelihood that a user will visit your website or choose you over a competitor because they know your name. Social Media also helps you gain more real estate in search results, specifically branded search results. This can come in handy if you have an online reputation issue. Negative articles, news, or reviews about your business showing up in the search results when a user searches your brand name can cause the user to be more apprehensive to trust your business. Owning and optimizing your social profiles can help them rank for your brand name, which in turn pushes those negative results down lower in the search results. Additionally, it helps keep competitors out of your branded search results. Social Media can be VERY powerful for local businesses as well. Google’s ranking factors for local search include proximity, relevance, and prominence. Prominence is a consideration of how “well-known” your business is. This looks at traditional SEO factors, like link building, but social media also plays an important role. The more users talking about your business on social media or sharing your content, the more “prominent” Google’s algorithms determine your content to be specific to localized searches. To ensure that your Facebook profile and content are optimized for SEO, we will be providing SEO best practices for social channels in this series. This post will be focused on Facebook optimization. Company Facebook pages have the potential to rank high in organic search, especially for branded search. Ensuring that your Facebook page and posts are optimized for SEO will not only help increase the visibility of your Facebook page, but also increase the visibility of your brand and gain more ownership of search results. To ensure that your Facebook page and company has as much visibility as possible, follow these optimization tips. Name – Make your name the company name and make sure it matches your website name, other social profile names, citations and local listings (if you are a local business). Username/URL – Select a username, which will be included in your Facebook URL. Here you can choose to select a user name that incorporates a keyword, a combination of your business name and a keyword, or just your business name. 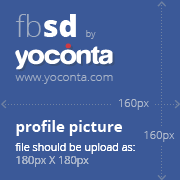 Profile Photo – Use a high-quality photo for your profile photo, consider your logo as your profile picture. Ensure that your image file name is optimized, your file name should be descriptive of the image, include keywords and words should be separated by hyphens. Cover Photo – Cover photos allow you to further customize your Facebook presence. Cover images should be high quality, interesting, and symbolic of your company. Like with your profile image, your cover photo file name should be descriptive of the image, include keywords and separate words with hyphens. For further information and size requirements, this Facebook Page is devoted to just that. About Section – Fill out as much as you can. Select your company category, try to select the most relevant category to your business, you can choose up to three so if there are three categories that work for you, choose three! Add your company mission, incorporating keywords where possible. Fill out as much of the About section as you possibly can! Include a keyword rich description of your company and what you do under about. Add when your company was founded and list any awards that you have received. If you have products, include your products under the products section in the About tab. If you are a restaurant, include your menu. Add your company story. This should be a narrative about the purpose and path of the company, again include keywords as you can. Contact Info –Include your phone number, contact email address, website, and address. Ensure that your phone number, address, and website URL are consistent with what is on your website and what you have used on other social profiles and local listings. CTA – Facebook allows you to include a Call-to-Action on your Facebook page. Ensure that this CTA is driving users to complete the action that you want them to, whether it be filling out a contact form, choosing “Contact Us” to drive people to your on-site contact form, or “Shop Now” to drive users to your online shop. Keywords – Although they have been mentioned throughout the above optimization recommendations, I am going to include a separate bullet as they are THAT important. Sprinkle keywords strategically throughout your Facebook profile. Include them in the most important parts of your page like your URL, About Section, posts, etc. way to ensure that Facebook shares of your content are optimized is to utilize Open Graph markup. This gives you the control to ensure that the Image, Headline, and Description you want to appear with the shared content does appear. improve their local visibility. Improve the potential visibility of your posts by sharing interesting and unique content, if your audience finds the content interesting, they are more likely to share it. optimized with file names that are descriptive, include keywords and separate words with hyphens. Additionally, ensure that you add a photo or video caption that describes the video and includes keywords. This helps add context to the image or video, and serves, in sort, as the ALT text. Content – Utilize Facebook Insights to help determine what kind of content to create and share based on the content that is receiving the most engagement from your audience. Determine themes, content types, and topics that are resonating with your followers. 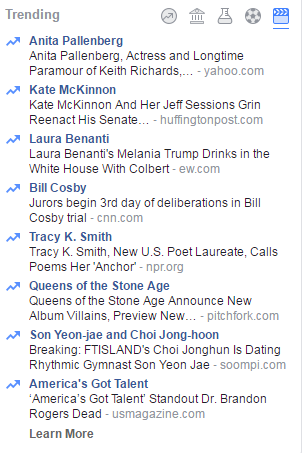 You can also utilize the “Trending” list on Facebook to help identify additional relevant topics that you can create content around or address in your Facebook presence. As mentioned previously, your Facebook presence is not a ranking factor for SEO, however, it can help improve your organic presence. If users aren’t finding your website in search, the next best thing would be one of your social profiles that are directing visitors back to your website. 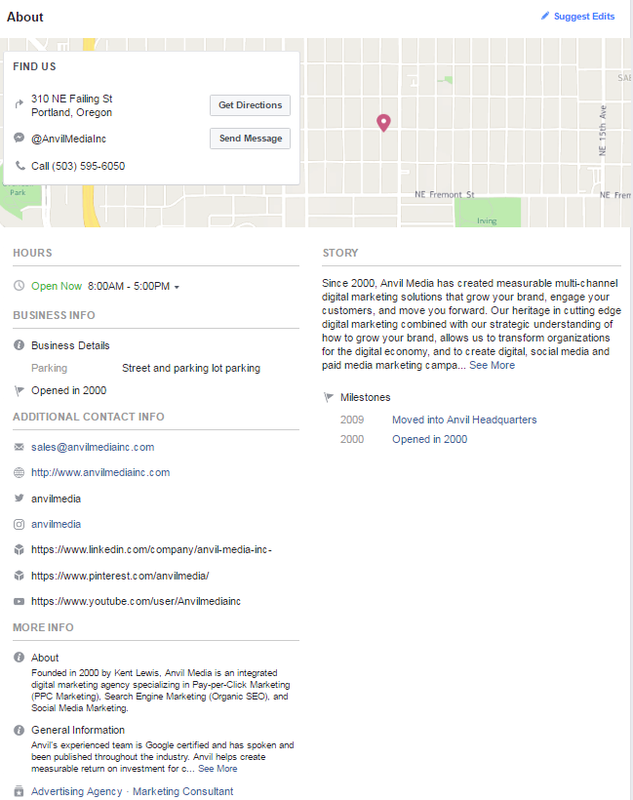 Additionally, improving your Facebook presence for SEO can help improve your Facebook reach, grow your audience, improve brand awareness, and help boost your local visibility, if you are a local business. If you are interested in learning more about SEO in general, SEO for Social, or any of our other digital marketing services, contact Anvil today! Coming next in this series will be SEO optimization for Instagram.